The Return of the Cloth. First, to answer her question, yes, I am using cloth diapers on Henry. I will be careful not to claim expert status because my experience is probably a little different than other cloth diapering moms. I am using (and used with Alex) a cloth diaper service. I'll explain a little about the logistics of that later. Second, I must state up front that this post is totally based on MY experience and MY opinions. I would never want anyone to think that I am instructing everyone to use cloth diapers. Sometimes they just aren't practical for everyone or won't work for various reasons and that's fine. There are many perspectives on diapering (like most areas of parenting), so please just consider this my perspective and not a mandate for everyone! 1. They are cheap. We are thrifty and disposables are expensive. Hey, let's be honest, the bottom line matters to everyone and I can say with certainty that cloth is WAY cheaper. 2. They are better for baby bottoms. Cotton on your baby's bum is much better than bleached paper. Also disposables are filled with little gel beads made from chemicals. Often, when a diaper is full it bursts and the beads can get all up in your baby's junk. I figure that my baby's tush is one of that last places I'd be willing to expose to unnecessary chemicals. 3. They are better for the environment. We are not enviro-nuts or anything, but we felt like using cloth is a responsible way to reduce the waste we produce in our household. When you consider that 18 billion disposable diapers are thrown into landfills each year, requiring a total of 500 years to decompose, it only makes sense to try to reduce our contribution to the overwhelming amount of waste. 1. Newborn breastfed baby poo is very runny. 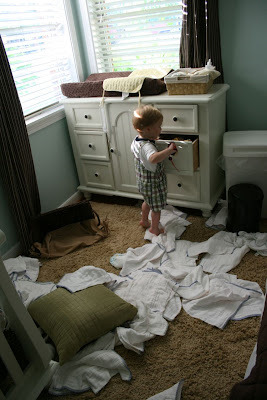 Since I use pre-fold diapers and a diaper cover, it sometimes makes a mess. It is rare that my baby's clothing is soiled, but usually the diaper cover gets a good dose of the mess. 2. When Alex got older (around a year old) and was eating a diet of regular foods, the diapers were just plain disgusting. My kid is really regular and poops about 4 times every day. Even though many online articles suggest that the poop can be simply shaken into the toilet, this was never the case for me. At this stage, it was a little too much for me to handle. I was in the early stages of pregnancy and just couldn't do the poop shake with the diapers. 3. Again, when babies are eating more "real" food, the diapers themselves were a little stinky. Breastfed baby poo is odorless, so this is not an issue for the first 6 months or so. But as their diet changes, it requires a little work to keep the dirty bin from stinking. There are deoderizers and other things you can put in the bin to keep it from being too stinky, but to say that the bin never stinks would be a lie. As I mentioned earlier, I use a cloth diaper service. This means that the service actually owns the diapers and does the work of cleaning them. Each week, they pick up my dirty diapers - which I leave outside on my front porch - and deliver clean ones. Many might consider this a "halfway" approach to cloth diapering, but it is still cheaper than disposable and allows me all the benefits of "full" cloth diapering. I use Thirsties brand diaper covers and have about 8-10 of them in each size. We knew we would use cloth for each baby so we went ahead and bought a supply of covers knowing we could use them longterm. This is one of the upfront expenses of cloth diapering. I recommend that you buy the covers a size at a time so you can evaluate if you are going to continue with the cloth. I would venture to say that most cloth diapering moms don't use a service and do their own washing of the diapers. Most of those moms would probably tell you that they are already doing lots of laundry already, so one more load of diapers is not an inconvenience. To get started, they simply buy the pre-fold diapers, covers and a good soap. It is recommended that you start with about 24-36 diapers and a trash can with a lid and a liner (some use plastic trash bags, some more sophisticated diaper hamper bags). There are complete instructions and tips on this website if you are doing your own washing. Probably many cloth diapering moms use all-in-one diapers. If you sew, you can make them yourself and save tons of money on purchasing them. Otherwise, purchasing the all-in-ones can be a bit pricey. I don't have much experience with these, so that's all I'll say about them. Perhaps some moms will want to comment on their experience with these. On a side note, I also use cloth wipes (for all the same reasons I use cloth diapers) and I love them. I make a wipe solution to put in a squirt bottle, wet the wipe, use it and toss it into a little trash can with a lid. When it comes time to wash them, I just dump them in a hot wash and then dry them. I gotta run because my free time is coming to a close, but I'm going to leave the discussion open to others who have used cloth and are willing to share their experience. The web has tons of resources and tips about how to cloth diaper. My best advice is to talk to others who do it and read about the benefits. Then you can decide if it will work for your family.